For Christmas this year, I’m pretty much making exactly what I made this past Thanksgiving, with a few changes to the dessert menu. Here’s my menu and the breakdown of what I make ahead. I make as much in advance as I can to make it a little easier on the big day. I’m breaking it down between four days. You can do it in two days if you’re pressed for time. I’m spreading it out slowly because I’m not rushed for time this year. Make a double batch of Buckeyes and freeze them. Use dairy free subs and coconut oil instead of shortening. Make Sugar Cookies and decorate. Make Pumpkin Pie and refrigerate. Make Double Batch of Chickpea Cutlets and refrigerate. Start Dough for Homemade Dinner Rolls early. When dough is ready, prepare rolls and bake. Boil and season fresh green beans (I use vegetable broth and season with Adobo, garlic powder and onion powder.) Transfer to a crockpot and cook on high for approximately 4 hours. Make Gravy. A triple batch. Use the suggested variation of adding poultry seasoning and sage to the gravy. I hope this breakdown helps. If you need any last minute recipes for Christmas, these recipes will not disappoint! I hope you have a wonderful week leading up to Christmas. This recipe was born out of desperation. I didn’t want to go to the grocery store and raided my pantry for something to make for dinner. I found a jar of Randall Great Northern Beans, tortillas, & some frozen Daiya mozzarella shreds in my freezer. I experimented and ended up with a new family favorite. The icing on the cake? It’s super easy. I can knock this out of the park in less than 15 minutes from start to finish. 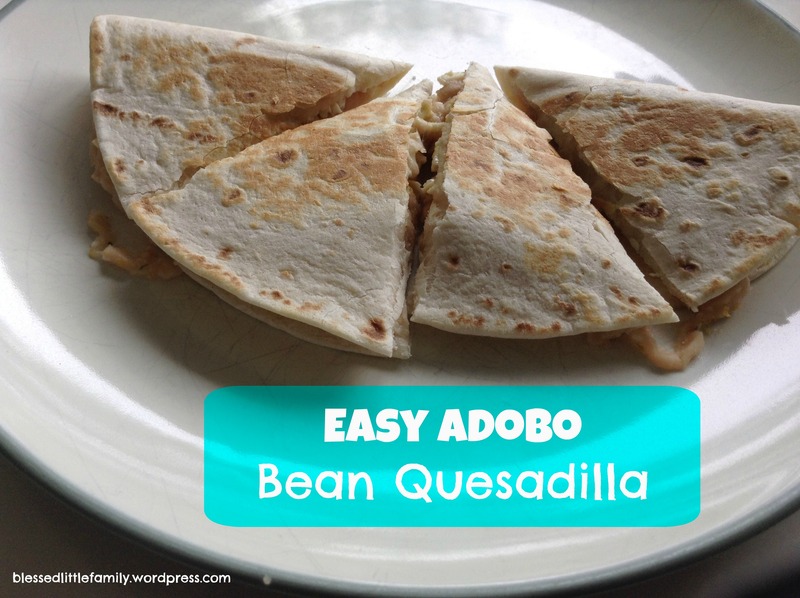 These quesadillas make great lunches or dinners. A veggie on the side is an easy way to finish off this meal. If you’re really short on time, steam in the microwave veggies make this entire meal even easier. And easy is good. Put drained and rinsed beans in a bowl. Use a potato masher to mash the beans. Add the tomato sauce and spices. Mix well. Use a spoon and scoop out a large spoonful of bean mixture on half of a tortilla. Sprinkle a generous amount of nutritional yeast on top of the bean mixture and sprinkle Daiya to your preference. Fold tortilla in half like a quesadilla. Brown quesadillas on a skillet or griddle. The griddle heats a lot at one time and is why I can have this on the table so quickly. Serve as is, with a side of salsa for dipping or with a veggie and/or fruit on the side. I use the fajita size tortillas and this makes approximately 7-8 quesadillas. Also, I don’t measure the spices- I just eyeball it. One time I accidentally shook WAY TOO MUCH onion powder in this and it still tasted amazing! This is one meal my five year old GOBBLES without complaint. She loves it and so do we. In this often busy and sometimes chaotic holiday season, this quick recipe helps get an easy and nutritious meal on the table. Ya gotta leave easy and nutritious, right? Y’all, we have some news. We’ve moved back down south! Which is why I didn’t post for months. Life was a little crazy for a long stretch. But now we have moved halfway across the country, sold our Iowa condo, bought a new house and are kind of settled in. We’ve been in our house for almost 6 weeks, so there’s still a lot to do. We hosted Thanksgiving at our new house and I was in charge of making almost everything. I’ve tried my hand at making my mom’s incredible cornbread dressing before and it was a flop- 2 years in a row. I gave up on making it last year. This year, however, I had a lightbulb moment. I discovered a gravy recipe from about.com and have adapted it to fit our needs. The gravy is creamy, delicious, and could mimic the canned cream of chicken my mom’s recipe uses. I didn’t even include it in my Thanksgiving post, because, well, I’ve failed miserably in the past. But not this time. This time I ROCKED IT! Finally!!! My mom’s recipe uses chicken broth, eggs, cream of chicken soup, butter, cornbread, sage, and minced onion. I decided to make my cornbread with gravy, but added sage and poultry seasoning to my gravy to give it the same flavor as my mom’s. I used vegan butter and vegetable broth. The result? My father asked my mom IF SHE MADE THE DRESSING! That was the moment I gave myself a secret high five and knew this recipe was good. So if you’re looking for a savory and delicious cornbread dressing recipe for the holidays or for any day, I have just the recipe for you! ( Cornbread recipe adapted from here. Make the cornbread the day before or first thing in the morning. I make it the night before as it frees up more time on the big day. 2. Grease an 8×8 inch baking dish with vegan butter. 3. Boil the water in a small saucepan and add the ground flax seed. Stir well with a fork or whisk. Reduce the heat and simmer the ground flax seed in the water for 2-3 minutes or until thickened, stirring occasionally. Mine was ready in 2 minutes. 4. Set the flax egg to the side. You’ll use it in step 6. 5. Grab a clean bowl and combine the flour, cornmeal, baking powder, and salt. Mix well. 6. Add the ground flax seed mixture, coconut milk, and canola oil to the flour mixture. Mix until just until smooth. 7. Put the cornbread mixture into the greased pan. Bake for 20 to 25 minutes, or until toothpick or knife inserted in the middle comes out clean. Mine was done in 20 minutes. 2. Make homemade gravy but double the recipe and add 1 tsp of poultry seasoning and 1/4 teaspoon sage. 3. Crumble cornbread in a bowl. 4. Add 1/2 of the gravy and a generous splash of vegetable broth. Stir well. Add more gravy and veggie broth until the cornbread mixture looks soupy. I used more gravy than broth because the gravy has all of the typical cornbread dressing flavor. You will not use all of the gravy- I had maybe 1/2 cup of gravy left. I splashed in veggie broth maybe 3 times. 6. Pour in soupy cornbread mixture. 7. Bake for 20-30 minutes, or until dressing is firm but not dry. I used convection bake and mine was done in 23 minutes. 8. Use the extra gravy to pour over the dressing. This is the cornbread dressing. I realized I had no photos of it and snapped this quick photo at the last second. Chickpea Cutlets with Homemade Gravy over Baked Potatoes (mashed) and Grilled Asparagus. Plant Strong Comfort Food! You guys. Y’all. This gravy is awesome. It really is awesome sauce! My 5 year old is now spoiled and wants this gravy on everything: baked potatoes, mashed potatoes, green beans, corn, cutlets… You get the picture, right? This gravy is also the superstar in my upcoming “Southern Cornbread Dressing” recipe. Stay tuned for that bad boy! Here’s how I make gravy in our house. 1. Heat the vegan butter over medium heat in a medium sized pot and add all of the spices and flour. Whisk together. 2. Add the vegetable broth and cornstarch and whisk well. Bring to a boil, then reduce heat to medium low and let it simmer, whisking constantly. 3. When the gravy has thickened, add the nutritional yeast and liquid aminos and cook for one more minute, continuing to whisk the gravy. **Variation: Add 1 teaspoon of poultry seasoning and 1/4 teaspoon of sage in addition to the spices listed above. Close up of gravy and my homemade mashed potatoes. YUM! On Thanksgiving day, I decided to deviate from my planned homemade ranch mashed potatoes, and try my hand at “regular” mashed potatoes. It turned out perfectly! The Huzz told me to please write down what I did before I forgot how I made them. Yes! If you are looking for creamy and “normal” tasting dairy free mashed potatoes, then you must try my Holiday Mashed Potatoes! Here’s how I made them, on a whim. Peel and chop potatoes. Add to cook pot as you chop. Keep a small amount of water in pot to keep the potatoes from browning. Place pot on burner and set to medium high until the water boils. Reduce heat to medium. Boil potatoes until tender, stirring occasionally. I use a wooden spoon across the top of my boiling pot to keep the water from boiling over. Drain potatoes in a colander. Return the potatoes to the pot. Mash potatoes using potato masher. Use an immersion stick blender for even creamier potatoes. Add several large spoons of vegan butter and a generous splash of coconut milk. Add a small splash of vegetable broth. Mash a bit more. Add salt and pepper to taste along with 1 or 2 generous shakes of garlic powder if desired. Mix well. Taste. Add more coconut milk, vegetable broth and butter, a little at a time. Mix well, taste, and repeat until desired consistency and taste is achieved.